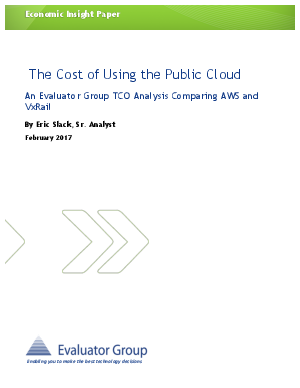 For many companies, the appeal of the public cloud is very real. For tech startups, the cloud may be their only option, since many don’t have the capital or expertise to build and operate the IT systems their businesses need. Existing companies with established data centers are also looking at public clouds to increase IT agility while limiting risk. The idea of building-out their production capacity while possibly reducing the costs attached to that infrastructure can be attractive. For most companies the cloud isn’t an “either-or” decision, but an operating model to be evaluated along with on-site infrastructure. And, like most infrastructure decisions, the question of cost is certainly a consideration. Backed by specific research, Evaluator Group helps IT end user clients with strategic infrastructure decisions regarding technology, economics, etc. Through this work we have developed tools, like TCO models, that can be applied to more general comparisons such as that featured in this report.